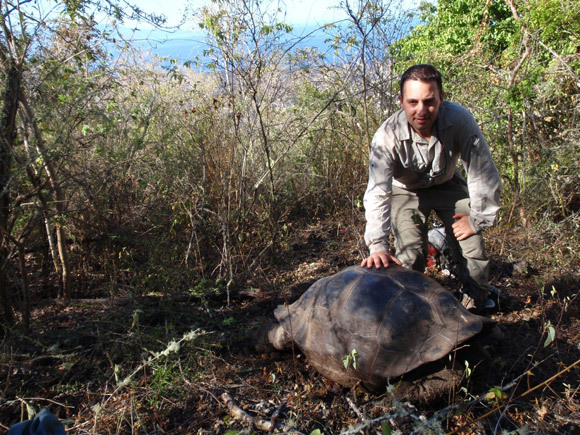 Researcher Michael Russello with a tortoise that is a hybrid of a tortoise species native to Floreana Island (Chelonoidis elephantopus) some 320 kilometres away from its habitat on Isabela Island, and thought to be extinct. A species of giant tortoise thought to be extinct since the mid-1800s did not totally disappear after all. New genetic research has found living tortoises from the Pacific's Galápagos archipelago that have remnants of an extinct genetic line -- a discovery that could lead to restoring the lost species Chelonoidis elephantopus through captive breeding. A unique species of giant tortoise once thrived on the Galápagos island of Floreana, but was presumed extinct soon after Charles Darwin’s historic voyage to the Galápagos Islands in 1835 due to extensive hunting. The results of the study suggest that direct descendants of at least 38 purebred individuals of C. elephantopus live on the volcanic slopes of the northern shore of Isabela Island — 320 kilometres from their ancestral home of Floreana Island. The research team, which included Russello and colleagues from Yale University, State University of New York, University of Crete, University of Florence, and the Galápagos National Park, published their findings this week in the prestigious journal Current Biology.